Under limited supervision of a location manager, the Customer Specialist provides exceptional customer service in a fast paced, team oriented environment through the facilitation of sales, vehicle condition assessment for appraisals, and while working in multiple environments including both indoors and outdoors. Interact with customers, other associates and team members to provide outstanding internal and external customer service. Sell vehicles to meet individual and store sales goals by following and implementing CarMax approved processes. Process paperwork associated with retail vehicle sales including, but not limited to: Printing daily reports, maintaining deal jackets, contacting finance companies regarding contracts, obtaining required information regarding registration and/or titling, processing reassignments, and auditing completed paperwork. Conduct vehicle condition assessments and conveys results to a Buyer or Senior Buyer for analysis and appraisal of value of an appraisal vehicle. Create, review, and close service repair orders for work performed. Route work to Automotive Repair Specialist and ensure accuracy of all labor, parts and sublet documentation for billing. Manage multiple payment types including but not limited to: receiving and counting money, distributing funds, preparing deposits with considerations to security and loss prevention. Ensure daily maintenance and security of the display areas and work-in-progress zones. 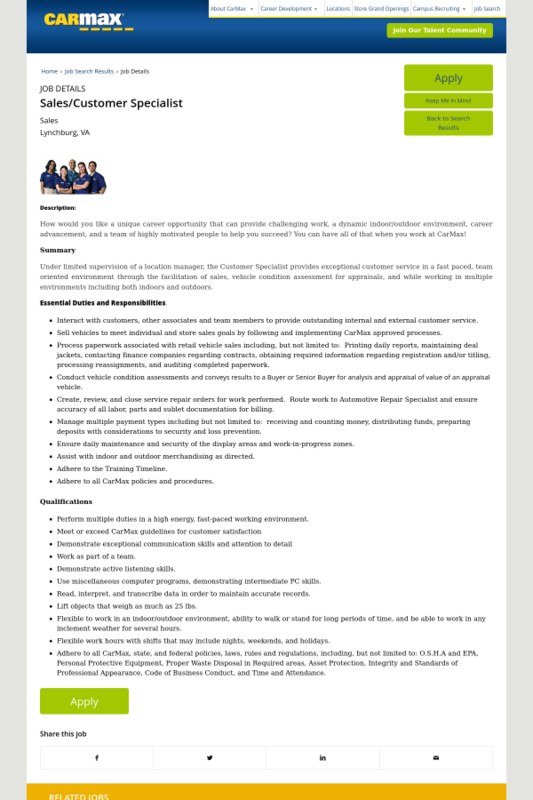 Assist with indoor and outdoor merchandising as directed. Adhere to the Training Timeline. Adhere to all CarMax policies and procedures. Perform multiple duties in a high energy, fast-paced working environment. Use miscellaneous computer programs, demonstrating intermediate PC skills. Read, interpret, and transcribe data in order to maintain accurate records. Lift objects that weigh as much as 25 lbs. Flexible to work in an indoor/outdoor environment, ability to walk or stand for long periods of time, and be able to work in any inclement weather for several hours. Flexible work hours with shifts that may include nights, weekends, and holidays. Adhere to all CarMax, state, and federal policies, laws, rules and regulations, including, but not limited to: O.S.H.A and EPA, Personal Protective Equipment, Proper Waste Disposal in Required areas, Asset Protection, Integrity and Standards of Professional Appearance, Code of Business Conduct, and Time and Attendance.